Anna Snow has spent twenty-one years at an orphanage in Bath. Placed in the orphanage at the age of four, she grew up there and remained there, first as an assistant to the matron and more recently as a teacher. Her small salary is supplemented by a stipend from the same unknown benefactor who paid for her to be reared at the orphanage, a sum that will continue to be paid so long as she remains at the orphanage. Anna is not unaware of all that her life lacks, but she is content with her lot. In fact, she has turned down three proposals of marriage, including one from artist Joel Cunningham, a fellow orphan and her best friend of many years. The very predictability of her life offers a safety that Anna values, but everything changes one day when she receives a letter from a lawyer summoning her to London for a discussion of her future. Provided with a chaperone and a private carriage, Anna makes the journey, filled with questions and uncertainties. Her questions and uncertainties only increase the next day when she is directed to Archer House, the home of the Duke of Netherby. Despite being mistaken for a governess and assured that she is in the wrong house, Anna refuses to be intimidated by the duke or by the roomful of aristocrats occupying the room where a lawyer insists she be seated. In his search for the young woman believed to have been the illegitimate daughter of the late Earl of Riverdale, the Riverdales’ lawyer has uncovered a shocking truth: Anna Snow is Lady Anna Westcott, the legitimate daughter of the earl. Moreover, since her mother was still alive when Riverdale married the woman who believes herself to be his widow, that second marriage is bigamous and the children of that marriage are bastards. Anna has inherited her father’s fortune and his unentailed property. Her disinherited siblings want nothing to do with Anna, vehemently refusing her offer to share their father’s estate, but her paternal grandmother and other assorted relatives embrace her and devote themselves to seeing that Anna acquires the wardrobe and the social skills of the lady she was born to be. Avery Archer, Duke of Netherby, is not related to Anna by blood. His stepmother is Anna’s aunt, and he is the guardian of Anna’s disinherited half-brother. Thus, his connection to Anna is a mere courtesy, and he owes her nothing. She may have the face of a Madonna, but she is nothing like the women who usually appeal to Avery. Nevertheless, he is intrigued by her dignity and self-possession: “He could usually read women like a book. She was a closed and locked volume, and perhaps that was why he liked her and found her interesting.” The interest is mutual. Anna senses that a different man lives beneath the flamboyantly dressed, fashionably bored duke. As the two spend more time together, an odd sort of friendship develops between them. Soon hearts are involved, and the dangerous duke and the newly minted lady surprise themselves and everyone else with where their feelings take them. 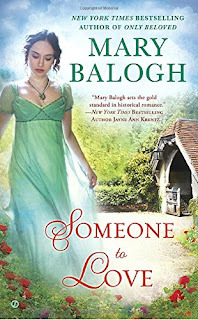 Someone to Love is the first book in the Westcott series. Balogh introduces more than a dozen Westcotts and other characters as she sets up the series. Some readers may find the number of characters confusing and, at least in the early chapters, wish for a more sustained focus on the protagonists and their relationship. But the patient reader will find the romance worth the wait. Anna and Avery are both atypical characters. Although they change during the story, much of their growth has occurred before the story opens. Anna has been shaped by her experiences in the orphanage. Key to understanding her is recognizing how important dignity is to her, her own and that of others. It is that dignity that helps her maintain her sense of self rather than be overwhelmed by the changes in her life. She had chosen to believe that she was no better than anyone. . . . She had also chosen to believe that she was no worse than anyone, that she was no one’s inferior, that she belonged on this earth as surely as anyone else did. Avery is short, slight, blond and beautiful. Sent away to school at eleven after the death of his doting mother, he is, by virtue of his small stature, pretty face, and lack of confidence, the perfect target for bullies. He endures several miserable years before he has a life-changing experience during his next to his last year at school. He meets an old Chinese gentleman who instructs him in martial arts and in the philosophy of the Orient. The discipline and the wisdom he acquires as well as the physical training and skills become the center of his identity, but it is a center he shares with no one. His power is as much the product of his self-knowledge as it is a product of his rank. Anna recognizes both his feminine qualities and his potent masculinity. He looked . . . beautiful. And graceful. And exquisite. And languid. They were all feminine qualities, yet he did not even for one moment give the impression of effeminacy. Quite the opposite, in fact. He looked a bit like an exotic wild animal, waiting to spring with perfectly timed grace and lethal intent upon its prey. Although Avery and Anna have both known sorrow, there is no angst in their story. They know who they are, and they like themselves. Their love story is one of deepening intimacy. Physical intimacy is certainly part of it, but their relationship is also one of emotional and spiritual intimacy. These factors make them immensely appealing characters. Among the secondary characters are several heroes-in-waiting. Alexander Westcott, a foil for Avery, is cast in the traditional heroic mold. I long to see more of Joel Cunningham, Anna’s artist friend; the dispossessed young earl turned soldier; and Avery’s incredibly competent secretary. Elizabeth, Lady Overfield, Alexander’s widowed sister who befriends Anna, and Anna’s angry, jilted half-sister are the most intriguing of the female characters, but the younger half-sister and Avery’s dramatic young sister will doubtless prove more interesting with a bit of maturity. These characters bode well for the books to come in the series. Balogh has long been an auto-buy author for me, and I found this book to be a promising start to a new series. The author’s superb Survivors’ Club series is a tough act to follow, and the Westcott books may be less extraordinary by comparison. However, this first one has beautifully crafted characters and a world that is a little bit Heyer and wholly, wonderfully Balogh. If you love historical romance, you will not want to miss Someone to Love. I can't believe I haven't read her as yet - I definitely need to change that! What treasures await you, catslady! A new Balogh series is great news ... thanks for the review! I have been working through the 'Survivors' series in audio, mostly read by Rosalyn Landor who for me is the perfect narrator for this type of romance. I hope so too, Q. I should try Balogh in audio sometime. Very excited, Janga! I would think it would be hard for her to top The Survivor Series, but then again I thought that with the Bedwyn series, too. There is just something about her voice that is very comforting to me. Out of the numerous books of hers that I've read, I think there have been maybe 1 or 2 that really disappointed. She's amazing. Thanks for the review. I love anything that Mary writes. Thank you for the review. Mary Balogh is one of my very favorite authors - Loved her Survivors Club series - looking forward to starting this next series! 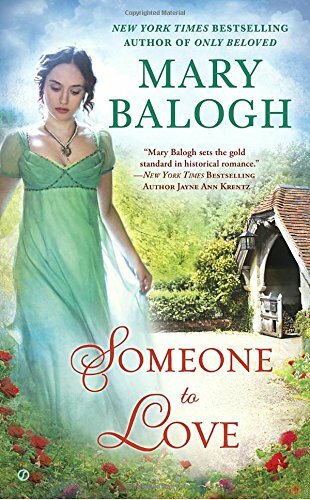 Mary Balogh is also a top auto-buy for me. Glad you like her new series, that means that I'd probably like it too.